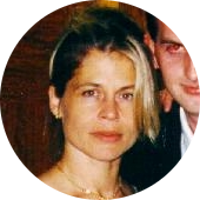 Linda Hamilton is an American television and movie actress. She is probably best known for her roles in The Terminator movie series and Beauty and the Beast television series. She has been nominated for a number of awards including three Golden Globes. In 1992 she won two MTV Movie Awards for Best Female Performance and Most Desirable Female for her role in Terminator 2: Judgment Day. Linda Hamilton is a direct descendant of Mayflower passenger William Brewster. She is also a direct descendant of Mary (Perkins) Bradbury who was convicted of witchcraft at the Salem Witch Trials in 1692. Her presidential kin include Presidents John Adams, John Quincy Adams, Chester Arthur, Millard Fillmore, Zachary Taylor, Grover Cleveland, Ulysses S. Grant, and a number of others. Linda Hamilton can claim kinship to the current British royal family through connections to Princess Diana, Queen Elizabeth II, and Catherine Middleton, Duchess of Cambridge. She can also count two wives of King Henry VIII as cousins, Jane Seymour and Anne Boleyn. Literary kin include poet Ralph Waldo Emerson, Louisa May Alcott, Clarence Day, Thomas Pynchon, Emily Dickinson , Tennessee Williams, Ernest Hemingway, John Seinbeck, Oliver Platt, and others. A number of Hollywood greats can be found in Linda Hamilton's family tree that include, but is not limited to, Katharine Hepburn, Humphrey Bogart, Richard Gere, Shirley Temple, Raquel Welch, Bing Crosby, Clint Eastwood, Christopher Reeve, Bette Davis, Vincent Price, and Anthony Perkins. Her fellow TV stars include Lucille Ball, Paget Brewster, Kyra Sedgwick, Amy Poehler, Ted Danson, and Elizabeth Montgomery.